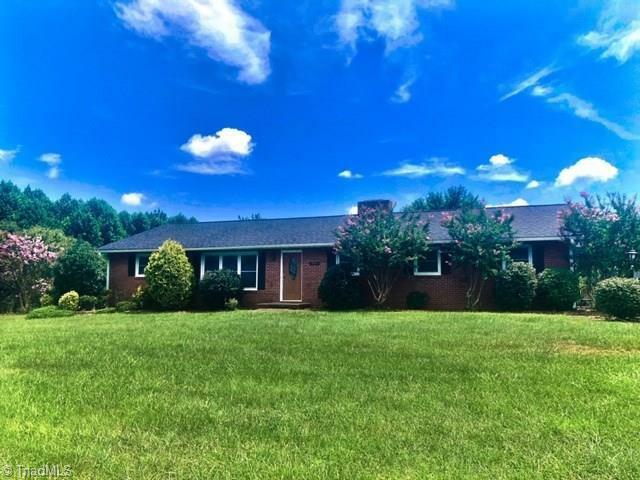 1355 Copeland School Road, Dobson, NC.| MLS# 896836 | North Carolina Farm and Vineyard Specialist Patria Properties Inc.
Beautiful one-level living on +/-3.72 Acres with large laundry room, tile floors, crown molding, HP/CA 2014, new hot water heater, new front door, hardwoods, updated windows, tile shower surround, large open kitchen/dining with fireplace in dining room, den and formal living room. 2 outbuildings, 2 car carport connects home and addt'l space heated by EBB with it's own 1/2 bath! Peaceful setting close to 268!